The 18,327 acre Sylvania Wilderness is a rare natural treasure because of its pristine lakes, old-growth forest, and sylvan tranquility. The lakes are fed by rain and melting snow and are therefore crystal-clear. Streams and their potentially polluted waters do not enter the lakes because of Sylvania's location near a watershed divide, at a relatively high elevation. Sylvania's forest contains one of two large remnants of virgin northern hardwoods remaining in the Great Lakes region. It owes its undisturbed character to the fact that it was a private hunting and fishing club for more than half a century. 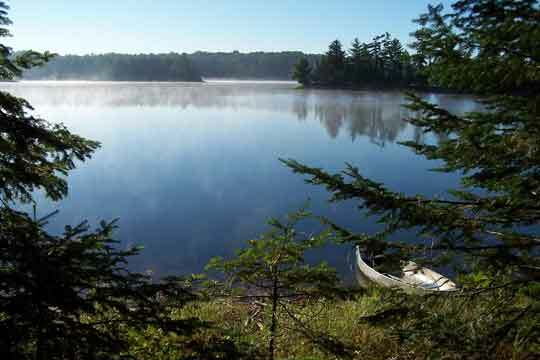 The Forest Service purchased the property in 1966 when it became part of Michigan's 'Ottawa National Forest'. It was designated a ‘Wilderness’ in 1987. Come to the Sylvania Wilderness for some great hiking, canoeing, fishing, snowshoeing, or skiing. We hope that the beauty of this place will encourage you to support our mission and to become a donor or to contact us to get on our electronic mailing list.